I wasn't at all sure how much fiber I would need for each part, so I started studying the specific yarns called for in the pattern (Fiddlehead Mittens - Hello Yarn) and checked on Ravelry project pages to see what kinds of yarns other people had used. Both original yarns were approximately 11 - 12 WPI (wraps per inch) and considered about a DK or Sport Weight. In some ways it is kind of fun to try and "match" a required yarn with my own handspun. Makes me feel like I am finally able to use my skills, and that all of the Wooly-Internet-Surfing has finally paid off? 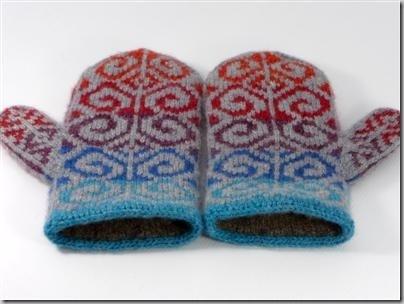 David used about an ounce of each of the 5 contrasting colors for his mittens, so I started there. Because I was afraid that I might lose/waste some of the fiber and be in trouble, I decided to use a little more than he did - about 2 ounces and hope that it makes enough for two pairs in the end. For the lining I carded up about 4.5 ounces of merino/angora. I think I will spin up all of the individual colors before I do the Main color, and hopefully I will be able to extrapolate a fiber quantity from my experience with the other parts. 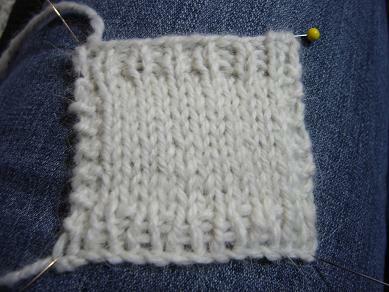 Here is what my final swatch of Angora Merino (10% / 90%) looks like - at around 11 - 12 WPI, I think it will work just fine. I've carried the swatch around in my pocket for a few days, hoping to bloom the angora halo of the yarn similar to what a little wear will look like. It doesn't seem to be getting pilly or anything, but the light angora halo is definetly starting to come out. At first I was a little disappointed with the greyish-oatmeal color, but I think it is growing on me. For a lining (where hands, and dirt may enter) it's Probably best that the lining isn't pure white anyways. The next step was to choose some colors and dye up some wool for the 5 contrasting colors. (My main color will be a natural white wool) I have a very minimal selection of Landscape Dyes, so for this project my colors were limited. I want to achieve heathery shades similar to David's so I settled on dyeing the roving in a "kettle" fashion, where the wool would be semisolid and then I'll card it to mix up the darker and lighter shades. Here is what I ended up with! You can sort of see in the picture how the color is more of a semisolid with some lighter and darker bits. I had folded up the roving accordion style, so when it went into the jar there was a repeating dark/light pattern. I made sure to put Hot wool (soaking in hot water) into the jars full of hot dye bath to avoid felting. After the wool was in, and comfy of course, I filled the sink with water as hot as the tap would allow, and stood the jars in the sink and left the whole thing to steep for about an hour. (I refilled the sink with hot water about halfway through) It was surprising just how hot it stayed in the jars. After the hour, when I rinsed, there was quite a bit of dye runoff which was disappointing. I had eyeballed how much dye to use. Must really go out and buy scale sometime. Now I am waiting for them all to dry (were still damp this morning) so I can start carding them up. I think I will try carding each colour alone first, and if there isn't a heathery enough feel, I might throw in a few handfuls of natural merino just to give it some contrast. Speaking of which... this means I should probably clean out my drum carder too. Sigh. Always more cleaning isn't there? I love it! I started some handspun Fiddlehead Mittens over the weekend, and frogged them too. Apparently I didn't pay any attention to the type of yarn required, and the mittens I was knitting would've fit the jolly green giant. Im determined to make these out of handspun, so I might have to card up some batts, we'll see. Can't wait to see your progress! Those colors will be fabulous in those mittens. I confess that I've been stalking David's work through Ravelry. He's an amazing spinner and has some of the best colorways in his fiber line. I am so impressed that you would dye and spin enough yarn for mittens. I do like this pattern, and I'm thinking hard about making lots of mittens for winter, but I can barely find enough time to *knit* - let alone spin too. Great spaghetti-sauce-bottle dyeing technique, too. I shall try it - with yarn! thank you MaryB... Sometimes I'm not sure where the time comes from either, but I just keep on playing with things and it all works out in the end. I've been admiring these mittens for a really long time, and then almost ordered the proper yarn online the other day, but it was really expensive and I was having doubts. Then I decided it might be more fun to just try dyeing it all. I guess you know which road I chose!